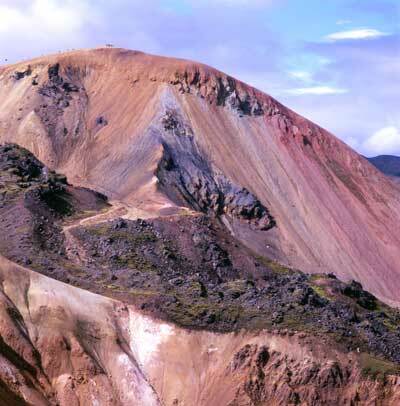 We arrived in Landmannalaugar in the late evening and nice weather. Just enough time to jump in the warm river and then fall to bed. When we woke up in the morning, the tent was leaning to the side, we had a storm, which already had pulled out 2 tent pegs. The storm was raging the whole day long and one tent after the other disappeared from the site, many had been blown down, or leaked so badly, that the users stayed the day at the quite large toilet building. I had to turn our tunnel tent with the narrow side in the wind and tied it down with heavy stones on the guy lines. The next day was nice weather again, we went up in the lava field just above the campsite. 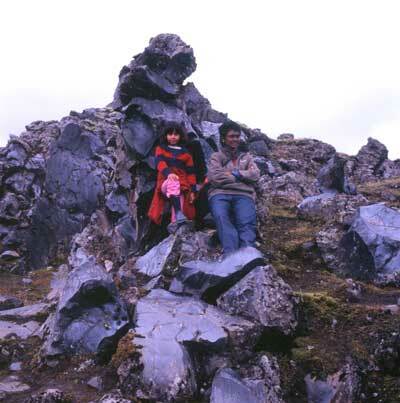 It is quite a special lava field, as it is entirely made out of volcanic glass (or better Obsidian). Sit back and enjoy a 360° panorama!